A Budget hotel with sober interiors near Madhapur bus stop. 18 Square is an affordable and trendy property located in Madhapur, Hyderabad. This property is only 5 mins away from Madhapur bus stop. The property is decorated elegantly. The white wall paint complements the flooring and wooden furniture. 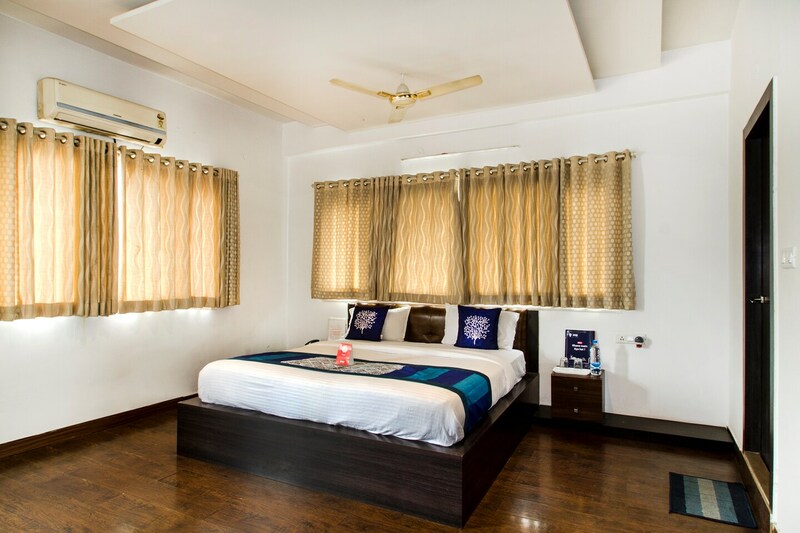 The rooms are spacious and decorated with curtains, cushions, wall paintings, and furniture. The washrooms are tiled in white and possess white accessories. The reception area is also decorated modishly with wooden furniture and wall paintings. Each room has an AC, TV, geyser, and a queen-sized bed. Other facilities are power backup, card payment, laundry, CCTV cameras, elevator, and a dining hall. The hotel has many famous eateries nearby, Abhiruchi Hotel, Mayabazar, 13 DHABA, Yelurii Ruchulu, etc. are a few. Idea Showroom, NSL Centrum Mall, Green Gold Store, Inorbit mall, and Forum Sujana Mall are good places to shop. By hiring a cab, you can visit some famous tourist spots such as Golconda Fort, Jamia Masjid, Mix bar, etc.